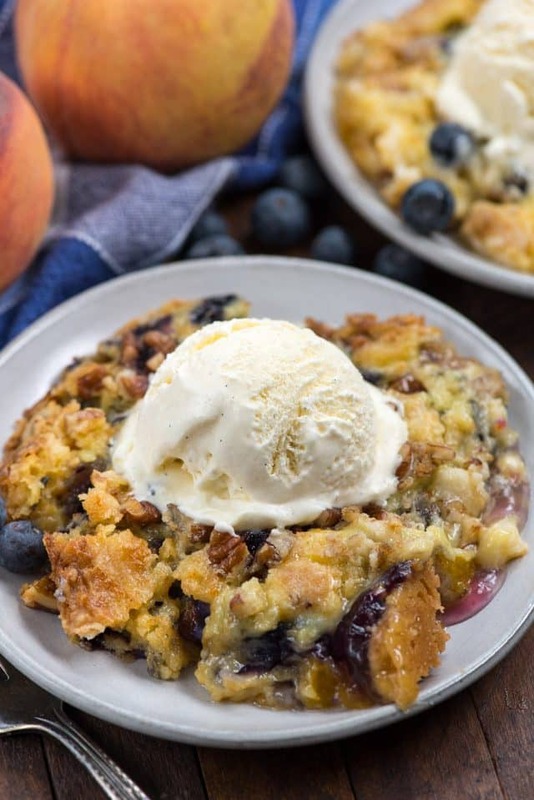 Make a Blueberry Peach Dump Cake for your next party – this EASY cake has just 5 ingredients and everyone loves it! Serve this room temperature or warm with lots of vanilla ice cream. This cake travels well too, so it’s perfect for a potluck! Funny story: I don’t like peaches. I don’t like the way they taste or the way they smell…basically I just don’t like them at all. BUT….I ate this cake. That means I either do like peaches and don’t think I do or this cake is very, very good. I like to think it’s mostly the latter (and maybe a teeny bit of the former). But probably, it’s because the peaches are combined with blueberries and cake mix and butter. I mean…is there a better combination than cake mix and butter? I don’t think so. Are you wondering why I would name a cake a Dump Cake? Trust me, I know how weird the name is. However, the name comes from the method: you just dump everything into a pan and bake. Dump cakes are the easiest kind of cake recipe…but really they’re no cakes. They’re more like a crumble or crisp recipe that tastes like cake because the crumble starts with a cake mix. Besides the cake mix, which can be any flavor, you can use any fruit and/or pie filling to make the filling of the cake. I’ve made cherry berry dump cake and cherry pineapple dump cake, as well as cherry peach. I really love dump cakes because they’re so versatile and easy to take to parties or serve with ice cream. Also, it turns out that Blueberry Peach Dump Cake can make you like peach when you don’t like peach. Who knew?! When you’re making a dump cake, the best part is there is no mixing bowl. You just need the pan you’re going to bake the cake in, usually a casserole dish or a 9×13-inch pan. You literally dump the can of pie filling and fruit into the pan, and then dump the cake mix on top. You may wonder how the cake mix turns into a crumble from just pie filling – and that’s because of the main ingredient: Butter. Glorious, glorious butter. Lots of butter is placed all over the top of the cake and while it’s baking, magic happens. The butter melts into the cake mix causing it to become crunchy and soft all at the same time, forming a glorious crumble crust for the fruit. 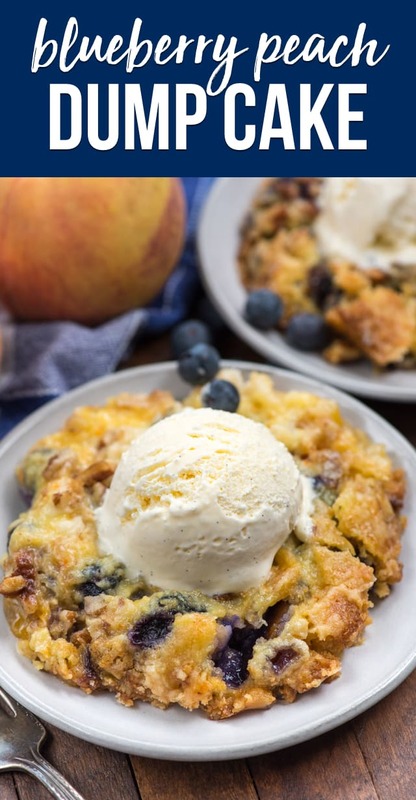 Dump Cakes are the perfect marriage of cake and cobbler, paired with your favorite fruit. 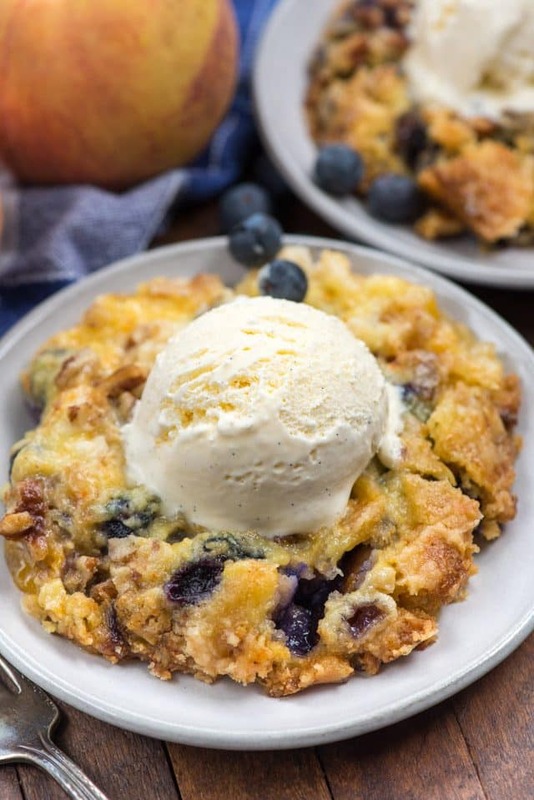 Blueberry Peach Dump Cake is the perfect fruit crisp for summer! I have a secret to make sure that the butter fully covers the dump cake during baking, and it came from a reader. What’s the butter secret when making a dump cake? Freezing it, then grating it. That’s right – freeze the butter then grate it over the crust. Freezing and grating it ensures an even coating. I’ve tried slicing it small and melting it and they all work, but the freeze and grate method has worked the best. I absolutely love all dump cakes and, math nerd that I am, I know there are more permutations and combinations of recipes than I can count. Pick a cake mix flavor and pick some fruit and you have dump cake recipes for years to come! Freeze the butter in sticks and grate it frozen. 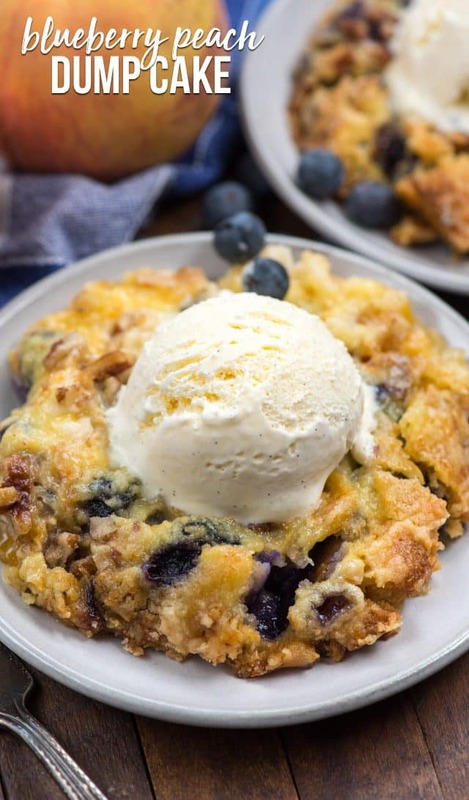 For this Blueberry Peach Dump Cake, I’d use a yellow or white cake mix. If you can’t find peach pie filling, use two cans of peaches and a can of blueberry pie filling. It’s easy to mix and match. Switch up the fillings and cake mix to your liking. I can’t wait to try a chocolate version! Make a Blueberry Peach Dump Cake for your next party - this EASY cake has just 5 ingredients and everyone loves it! This cake has blueberries and peach pie filling and is topped with a cake mix. It's the easiest ever party dessert! Tip: place sticks of butter in the freezer for at least 15 minutes. Then use a grater grate the butter so that it spreads easily over the top of the cake. Pour pie filling, peaches, and blueberries in the bottom of a 9x13-inch pan. Top with powdered cake mix. Sprinkle brown sugar and nuts, if using, over the top. Bake for 45-50 minutes. Serve warm or room temperature with ice cream. Store in refrigerator for up to 3 days. I’ve got a ton of dump cakes for you to try, including a pumpkin dump and the ones below. Or try Lisa’s Apple Pumpkin Dump Cake, Jocelyn’s Blackberry Lemon Dump Cake, or Deborah’s Gooey Caramel Chocolate Dump Cake! 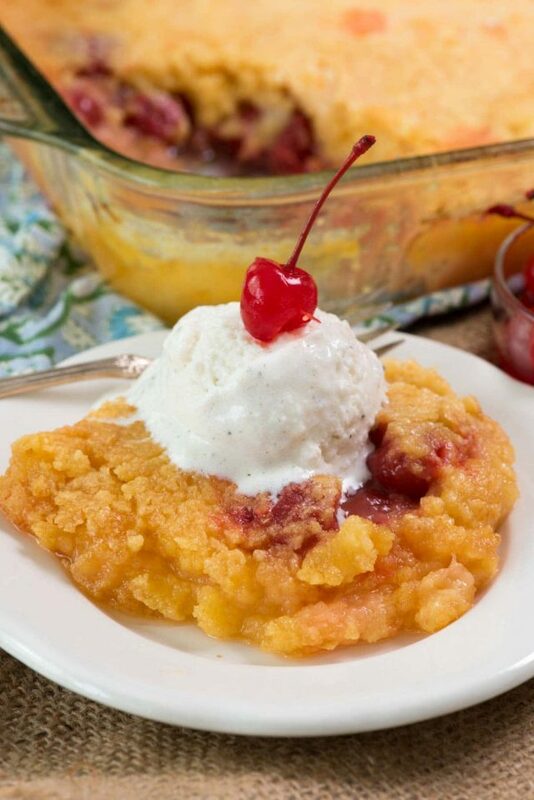 Pineapple Upside Down Dump Cake is the traditional pineapple and cherry version. 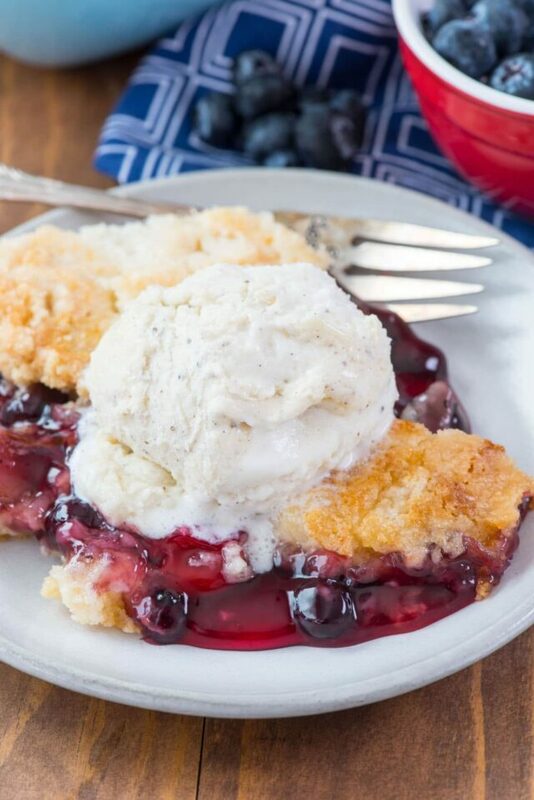 Make Cherry Peach Dump Cake instead of blueberry! 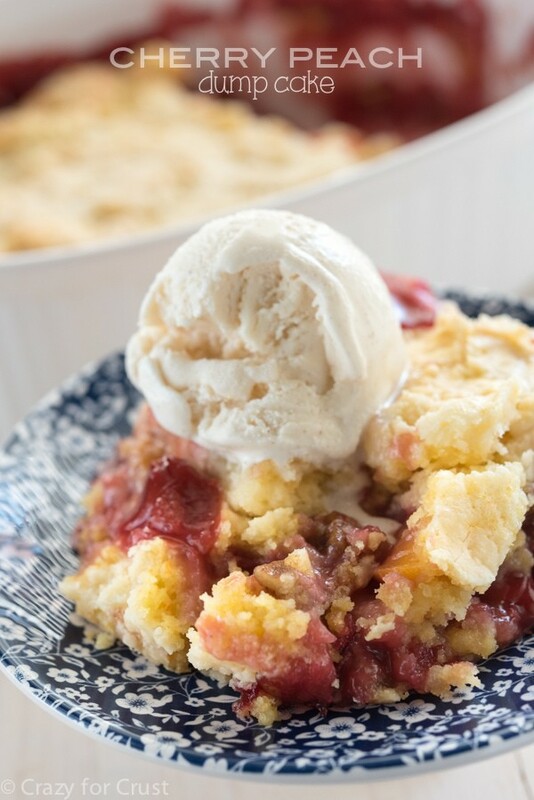 Cherry Berry Dump Cake is perfect for summer! My dump cake is famous at my husband’s work. This is what I do differently. I mix the melted butter and cake mix in a little bowl. Then I pat pieces in my hand and place them over the fruit. Just cover it all and fill in spaces. Then I put the fairly finely chopped nuts over that. No dry cake spots and its evenly covered. It works like a dream. I found this recipe over three years ago and I still make this cake. I have a request to bake one next weekend for a birthday party. Everyone that has tried a piece just loves it. Sounds great! When I make these I want less fat so I use half the butter (love the grating idea) and the other half applesauce. I love dump cakes! This looks absolutely delicious! Dump cakes must of been born in the south….a church function or cook out isn’t possible without 3-4 different dump cakes. But somehow, I’ve never had one with fruit, how have I lived !? Love the method of grating the butter! It does provide such better coverage and is super easy. I’m going to try this idea of “grated” butter. I’ve made dump cakes before and always melted my butter and drizzled over the top and have some dry cake mix but this sounds perfect to grate it! Thanks for the tip. Upping a reviewer suggestion, I mixed melted butter and cake mix, poured over wax paper on cookie sheet, cooled in fridge, then carefully peeled and placed it over fruit in 9×13. Worked like a charm!